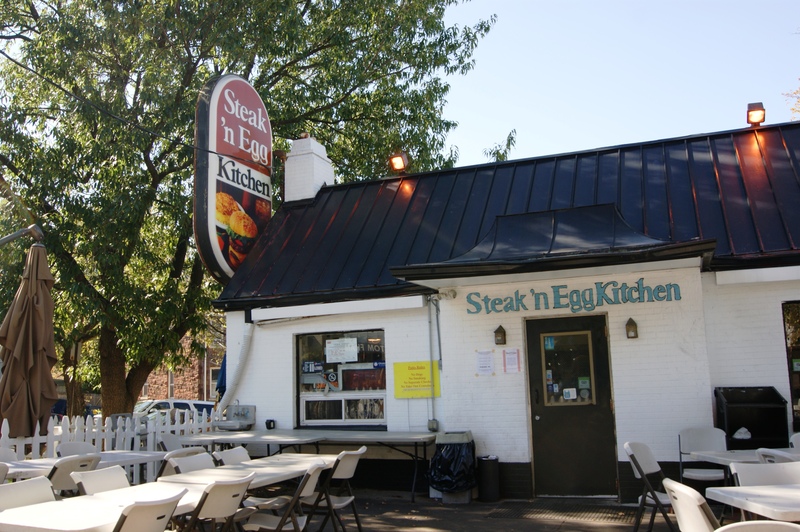 Steak ‘n Egg to Remain Open for Another Year | Tenleytown, D.C.
Posted on December 3, 2013 by Tenleytown, D.C. Ever since a raze permit was issued in June for the building that Osman and Joe’s Steak ‘n Egg Kitchen calls home, Tenleytowners have been abuzz with worry that the beloved neighborhood institution was going to close. Every month or so new rumors sprouted that our favorite greasy spoon was going the way of the dodo. Just this month, PoPville posted that Steak ‘n Egg would likely be closing for two years starting this January, generating a flurry of comments and concern that the restaurant could not survive a two-year hiatus. However, the rumors of Steak ‘n Egg’s demise have been greatly exaggerated. In a phone conversation this afternoon, owner Osman Barrie set the record straight. While the restaurant will close for major renovations, that won’t happen until January 15, 2015. Construction is anticipated to take up to a year to complete, but Barrie is hoping that if all goes well Steak ‘n Egg could re-open as early as September 2015. During the closure, Barrie plans to open another Steak ‘n Egg in Adams Morgan, which would remain as a second location once the Tenleytown diner reopens. Negotiations are still underway for the Adams Morgan location so he was unable to provide additional information on the site. To help ease worried minds missing Tenleytown’s Steak ‘n Egg, and keep the neighborhood up to date on construction, Barrie said he plans to build a website and create a Twitter account for the renovation. Tenleytown, D.C. will have more updates as they are available. But for now, Tenleytown and fans of Steak ‘n Egg can rest easy for at least another year. Do you know the Dancing Crab Restaurant which has been in business since May, 1973, is closed for major renovation? The November 25th closure was a disappointment for fans of the Dancing Crab, but we can’t wait to see the changes and be back at a table in the spring when it reopens. I’ve always wondered how The Prince Cafe next door stays in business. I never see anyone inside and it’s no surprise given how poor the reviews are. The Prince Cafe is actually further up Wisconsin and on 41st Street. Your point about slow diner traffic, however, is well taken. I haven’t eaten there myself, yet, but it’s on the list for a review soon.